The Trump administration vows to fight CNN lawsuit which claims the journalist’s constitutional rights were violated. A federal judge will hold a hearing on Wednesday on a CNN lawsuit against President Donald Trump‘s administration after the White House revoked the press credentials of the network’s journalist last week. The American network said its correspondent Jim Acosta’s removal was a violation of his First Amendment rights to freely report on the government. The dispute on live national television and Acosta’s resulting banishment triggered a wave of accusations that Trump is stifling the free press, and marked a sharp escalation in tensions between the president and CNN. “The wrongful revocation of these credentials violates CNN and Acosta’s First Amendment rights of freedom of the press, and their Fifth Amendment rights to due process,” the news network said in a statement, announcing the lawsuit filed on Tuesday in Washington. 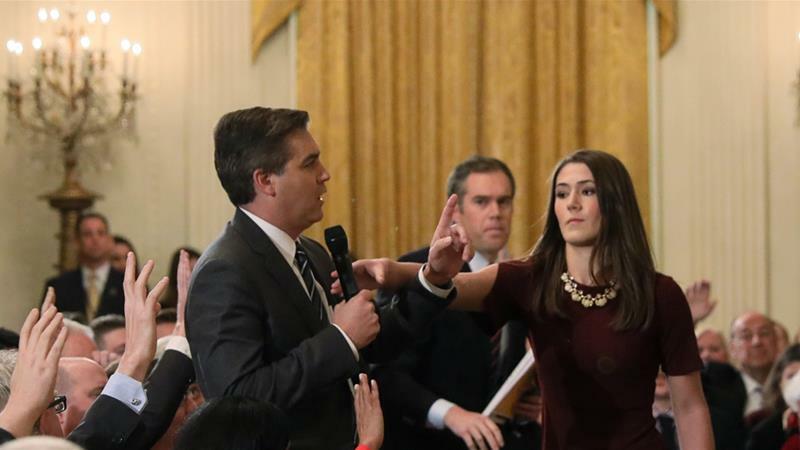 The White House had suspended Acosta’s hard pass after he sparred at a news conference with the president, who demanded that the reporter give up the microphone and called him a “rude, terrible person” when he did not immediately comply. White House Press Secretary Sarah Sanders released a statement accusing Acosta of “placing his hands on a young woman just trying to do her job as a White House intern”, calling it “absolutely unacceptable”. Hours later, Sanders announced Acosta’s hard pass had been suspended, in a move that she justified by claiming the reporter was inappropriately “placing his hands” on the intern. “The First Amendment is not served when a single reporter, of more than 150 present, attempts to monopolise the floor,” the press secretary said in a statement.